This article was written in summer 2013 and was recently published by the Essex Jewish News (Chanukah edition). In 2013, we are approaching a significant milestone in the history of the North East London Jewish community. Our community will be celebrating the 20th anniversary of its only Jewish secondary school. This particular anniversary is taking second place to the even bigger milestone of the rebuilding of Ilford Jewish Primary School on the King Solomon campus. 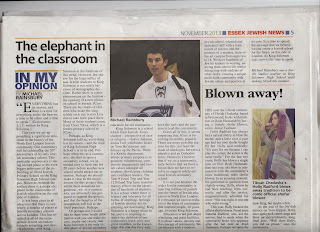 However beneath the surface there is a major elephant in the classrooms of Jewish education on the East side of London. It has been clear to all observers that there is currently a surplus of places at Jewish secondary schools across London. This has resulted in all of the mainstream Jewish secondary schools accepting non-Jewish children, with King Solomon at the forefront of this trend. However the reason for the large influx of non-Jewish students in King Solomon is not solely because of demographic decline. Rather there is a new phenomenon on the horizon – the opening of a new pluralist school in Barnet, JCoss. There are busloads of children who make the long schlep each day across London to take their place there. Many of these students come from Clore Tikva School, which is a feeder primary school to JCoss. Perhaps, as King Solomon told us, everything has its season – and the time of King Solomon High School’s is at its end. Perhaps when we as a community decided to open a secondary school we only intended to have one for 20 years before another new school would attract our attention. Perhaps we should make it clear to the major donors for this project that whilst their donations are generous, we as a community are ultimately not prepared to support the project, and that the benefits of the investment will fall to the local populace. Perhaps. Or perhaps not. I would like to share some inside information with you and make the case loudly and clearly that King Solomon is the only viable place of Jewish secondary education for our community. King Solomon is a school which feels Jewish. Every student – irrespective of race or religion – studies Judaism, learns Ivrit, celebrates Israel on Yom Ha’atzmaut and dresses up for Purim. There is a Kehila department, whose primary purpose is to promote volunteering, community engagement and Jewish values amongst all students, developing children into confident leaders. The Year 9 Israel Trip and Year 12 Poland Trip have transformatory effects on the identities of hundreds of students. It is a school where there is respect and tolerance for all faiths. If anything, feelings of Jewish identity are increasing not decreasing. King Solomon is a happy place to be and it is inspiring to watch the children of our community learn, play and grow together, in the knowledge that one day they will have the tools and the passion to lead the community. Given all of this, it seems surprising that JCoss is becoming incredibly popular. There are many possible reasons for this, not least the clash of ideologies between a pluralist and an Orthodox ethos. However I believe that if we as a community truly believe that we have a future then we have to resolve to solely support our local Jewish secondary school. It is not just because the wider Jewish community is injecting millions of pounds into the future of Jewish education in North East London. It is because we need to rediscover the sense of community that inspired people 20 years ago to create King Solomon. Education is not just about a building and good facilities. It is about values, identity and the concept of community. We are blessed with a modern Jewish school, talented and dedicated staff with a track record of success and the promise of a modern state-of-the-art campus from ages 2-18. We have hundreds of Jewish leaders-in-waiting enjoying their school life whilst interacting with students of other faiths, creating a unique multifaith community with Jewish values and practice at its core. It is time to spread the message that we believe we can create a Jewish school for the future on this side of London. As King Solomon says, now is the time to speak.